2019 IS A BANNER YEAR for the citizens of Huntsville, Alabama as we celebrate the Bicentennial of Alabama and the 50th anniversary of the moon landing, both of which featured a prominent role for our fair city. On Friday, August 2, 1819 the 44 delegates of the Alabama State Constitutional Convention in the state’s first capitol, Huntsville, unanimously approved the first constitution of the State of Alabama. Congress and President James Monroe would agree. Congress did so on December 3, 2019 and President Monroe signed the law on December 14th, 1819, making Alabama the 22nd state in the Union. Spin ahead 140 years and the cotton-centered economy of North Alabama was going bust; cotton mills were no longer making money and were closing. However, the shuttered Redstone (and Huntsville) Arsenal was no longer used for the manufacture of chemical and other explosives as it was in WWII. On 1 June 1949, the Army Chief of Ordnance designated Redstone Arsenal as the Ordnance Rocket Center, its facility for ordnance rocket research and development. In April 1950, the Fort Bliss missile development operation, then with (Werner von Braun’s) 130 German contract employees, 120 civil-service employees, and 500 military personnel, was transferred to Redstone Arsenal. This became the Ordnance Guided Missile Center (OGMC) (per Wikipedia) and later the Army Ballistic Missile Agency. This partnership resulted in the launch of Explorer I, the United States first satellite, on January 31, 1958. Explorer used a Redstone rocket developed by the von Braun team in Huntsville to launch the satellite. National and international history was made in the red dirt of the Tennessee Valley in these events and Journeys of Huntsville: Celebrating the Bicentennial of Alabama and the 50th Anniversary of the Moon Landing details this history in both fiction and nonfiction, short stories and articles, and even poems from local high school students. Journeys of Huntsville is a work of love and of the community. Several local organizations contributed, including the Huntsville-Madison County Historical Society, the Historic Huntsville Foundation, the Huntsville Museum of Art, and Old Huntsville Magazine. Numerous authors from these organizations contributed articles and several local writers also contributed other articles, short stories and memoirs of these events. Journeys of Huntsville represents the efforts of the Huntsville Master Chorale (HMC), the Tennessee Valley’s home of classical and modern chorale excellence and expression as a path toward composing selections on these themes for their Spring 2019 concert. All proceeds from Journeys of Huntsville will go to HMC who also partnered with the Huntsville-Madison County Public Library to get the poems on these themes from local area high school students. The student winners received cash prizes and their poems formed the lyrics for a separate music competition of composers. Olivia Fox’s third place poem, Ignition, was used by Evelyn Pursley-Kopitzke’s for her winning composition of the same name. HMC premiered Ms. Fox, Bob Jones High School, and Ms. Pursley-Kopitzke’s work of voice and instrument on May 3, 2019 in Huntsville at Aldersgate United Methodist Church. 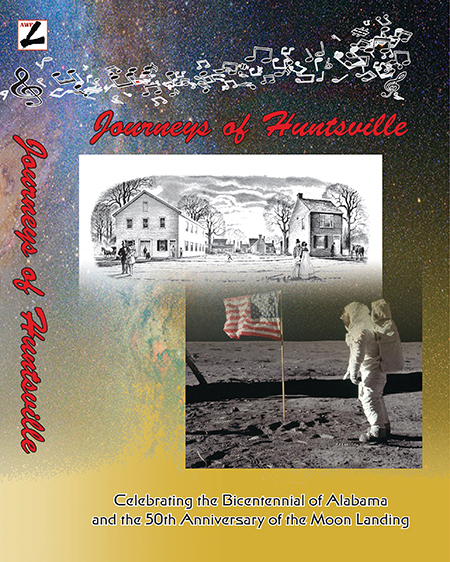 Journeys of Huntsville: Celebrating the Bicentennial of Alabama and the 50th Anniversary of the Moon Landing was published by The Ardent Writer Press in March 2019. The link to Amazon for the paperback version (COLOR interior) of Journeys of Huntsville is HERE. The link to Amazon for the hardback version (COLOR interior) of Journeys of Huntsville is HERE. The link to Amazon for the eBook Kindle version of Journeys of Huntsville is HERE.